APRIL 4TH – Departure – I can’t believe it’s finally here, I left Kim at the flat at 9am and mum dropped me at the station at 11 in time for my train. I got the train to London from Warrington and then got on the underground to Heathrow. I had planned to meet up with the 360 expeditions guide Rolfe in a cafe at 17:30. Got to the airport for about 3pm and spent 2 hours wondering around with the worlds HEAVIEST bag, had some food and walked to meet Rolfe. Met Rolfe and his colleague Hugo (who isn’t travelling with us). Quick pint to calm the pre flight nerves and we had a chat about the trip. Hugo gave me a windproof jacket / fleece and 2 buffs! I was made up. We had our photo taken under the sign to Delhi and checked in. Rolfe is great, really easy going and a funny guy too. He’s really keen to do some filming with me whilst we’re out there and show me the build up to his summit attempt on Everest and Lhotse. Rolfe is meeting with a woman called Jo who he plans to take to the top after their failed attempt last year (2015 earthquake) she’s already out there acclimatising. Rolfe told me the story of last year when the earthquake hit, he was at camp one at the time and 20ft from death when an avalanche swept past their tent, not helping with my nerves at all. APRIL 5TH – LDN – DEL – KTM – Long overnight flight to Delhi where we changed for a flight to Kathmandu. We finally arrived in Kathmandu to a crazy airport, there was literally one belt for all of the flights that came in which meant we were waiting for ages for our bags. I was beginning to think mine had been left in Delhi! It finally came through as did Rolfes and we headed outside where we met Jo and the sherpas. They gave us both a bottle of water and a wreath of flowers as a welcome to Nepal. We headed on a mini bus through the busy streets of Kathmandu, I don’t think I said a word, I was too busy taking it all in, it was rush hour and the streets were absolutely rammed. We arrived at our hotel, the Kathmandu Guest House, it’s really nice, although half of it is missing from the earthquake! APRIL 6TH – Kathmandu – I had a last minute preparation day in Kathmandu to get bits and bobs I still needed for the climb. I had pretty much everything sorted but still needed some plastic boots to stop my toes falling off when we get above 6000m. Jo gave me directions this morning for a trusted rental shop, the problem round here is buying fake gear and only realising out at the top when you find out your down jacket isn’t as warm as was promised to you by the seller. I went along to the shop and tried on some boots, the guy was really nice and helpful. I walked up and down the stairs making sure the boots fit properly and he didn’t charge me a deposit because I said I was with Jo. He asked me if I had climbed before and I said “only in the UK”, he replied “they’re only hills aren’t they? not mountains”, I said jokingly “well ask me again in 4 weeks time when I come back” to which he replied “that’s if you make it back”.. We both laughed, (I hope he was joking). Spent the afternoon wandering round Kathmandu and putting credit on the Nokia, I’ve had it on since I left and it’s still got a full battery! They don’t make them like this anymore, oh and I’ve got a new record on snake 2, 855! Spent the rest of the day sorting out my kit for the flight in the morning to Lukla, I had a 30kg limit coming over but can only take 15kg to Lukla and I’ve bought more stuff! I’m going to struggle here. Jo tells me the flight depends on the weather, here’s hoping for some sun, Kathmandu stinks and there’s tonnes of rats! Went for a meal and a few beers with Jo and Rolfe, probably the first time we’ve properly sat down together. They knew each other before this trip so I feel out of place around them, they must see me as a novice out here as I’ve never done anything like this at all and they’re both pros. We spoke about their summit plans and how it really is weather pending. If the weather is anything but perfect, they can’t attempt to summit and their climb could be over before they know it. We headed back to the room about 9PM ready for a 6am pick up and flight to Lukla, I’m praying for some good weather. APRIL 7TH – Kathmandu to Lukla to Phakding – Up at 05:20 and on the bus to the airport at 6am. The airport security was dreadfully hilarious, you just had to laugh. We got onto a tiny plane, I’ve jumped out of bigger ones! The flight was scary, we kept dropping 10ft or so with the air pressure but I got used to it after a while. Met Isu who is going to be my own personal guide when in the mountains, he seems really nice and has worked with Jo and Rolfe before, they say he’s good. The views out of the window were breath taking, I was on the wrong side of the plane to see the Himalayas and spent most of the flight leaning over some poor lady trying to get some photos. When we came in to land, for a second I thought we were going to crash. The run way for the airport is on the edge of a mountain and goes upwards! It’s about the length of a football pitch too so there’s no room for error. We landed in Lukla, I’m not looking forward to that flight out but that’s the last thing on my mind at the moment. We had breakfast at a local tea house whilst Isu and the other sherpas sorted our bags out. Isu is brilliant, he’s about 4ft tall and carries a bag twice the size of him. We finally set off about midday and I walked alongside Isu through the trail leading out of Lukla and into the valleys, we set off at a good pace, I was keen to impress. At 2860m, Lukla is already the highest I’ve been, Jo joked before we set off and pointed out that I’m breaking personal records every day, I like that. The route was up and down and the path wound through the small villages hugging the steep hills to our right as we walked. It was at least 25ËšC but I felt really strong and what should have taken 3 1/2 hours took us just over 2. What a huge mistake that was though. I am already paying for the speed, I have what looks like the start of blisters on the base of both my feet, these boots are sh*t! We arrived at our overnight stop and were shown to our rooms, not bad! We stay in tea houses up the route until summit nights, apparently the facilities get worse and worse. Had a walk late afternoon with Isu a good 300m up a mountain behind the tea house to visit a monastery, the old building sat overlooking the valley from Lukla, we could see the river leading all the way to the mountains, it was incredible. Climb high sleep low is the key apparently (I’ll definitely sleep tonight). Woke up after 2 or so hours of sleep feeling a bit sick, I put it down to the altitude and tried to get back to sleep but made the fatal error of blowing my nose and was covered in blood. Had a 5 minute panic before stuffing tissue up my nose, the air must change of a night as I had a really dry mouth, no matter how much I drank it never went away. APRIL 8TH – Phakding to Namche – Woke up at 6am, had breakfast and set off for Namche Bazaar about 07:45. The sore spots from yesterday had blistered over night and hurt after the first 100m or so and Isu told me we had 5-7 hours of trekking left – great! I managed to put the discomfort to the back of my mind and we headed on through the foothills of the himalayas, crossing unsteady bridges and climbing steep hills. The weather was glorious, it must have been 30ËšC or so and we passed a few people who were really struggling on the route. I feel really bad walking next to porters who are carrying bags 10x heavier than mine, one had about 10 crates of lager on his back and was still quicker than me! Hats off to him. We had been walking for a good few hours when I finally got my first glimpse of Everest! Isu took me up a narrow track off the main route. We crouched down and through the trees could see the plume of snow coming off the summit. It was amazing, I’ve read so much about this mountain, seen all the photos and there it was, right in front of me. I had the biggest grin ever and even forgot about my sore feet (didn’t last long though). The route got steeper and I could feel myself slowing. 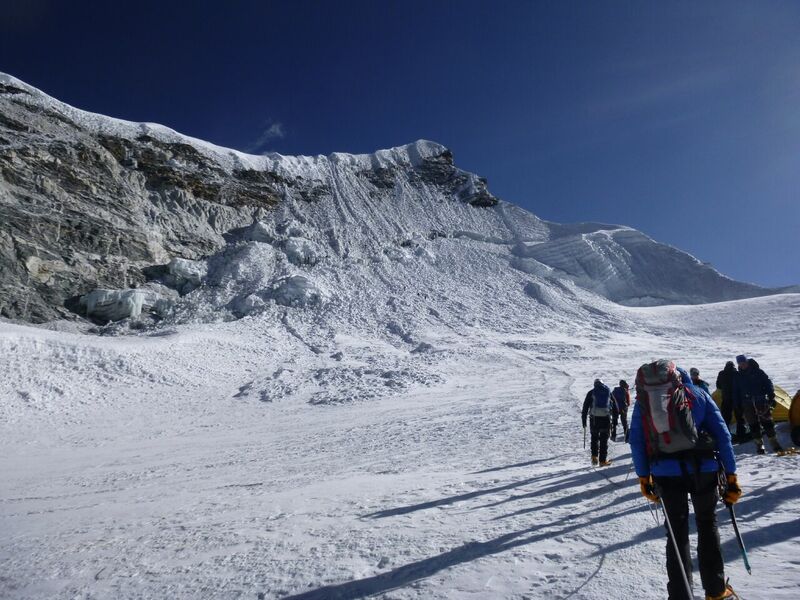 Moving just 10 steps at around 3000m is tough – especially in the sun. A dirt track up a very steep hill was all’s that was left before we reached Namche and we pushed on arriving in about 5 hours. Namche is beautiful, and the view out of the tea house is amazing. You can just see mountain giants all around, covered in snow. I spent the afternoon hobbling round Namche searching for some shoe in soles, anything to help these blisters, they’re unbearable. You’d be surprised but the Nepalese really haven’t got a clue what you’re saying when you ask for an in sole and I thought I was going mad but after about an hour of looking, I settled for the next best thing – sanitary pads! I just needed something that would cushion my heels, I’m in agony. Fingers crossed they work. 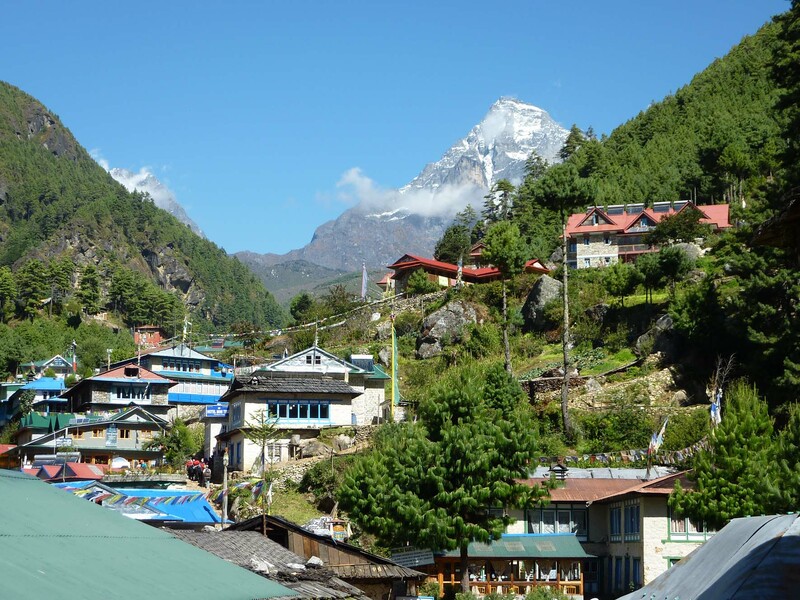 APRIL 9TH – Namche acclimatisation day – The schedule has included rest days to help catch up with the altitude and to prevent me from getting sick. Left early morning with Isu and headed to a museum nearby. 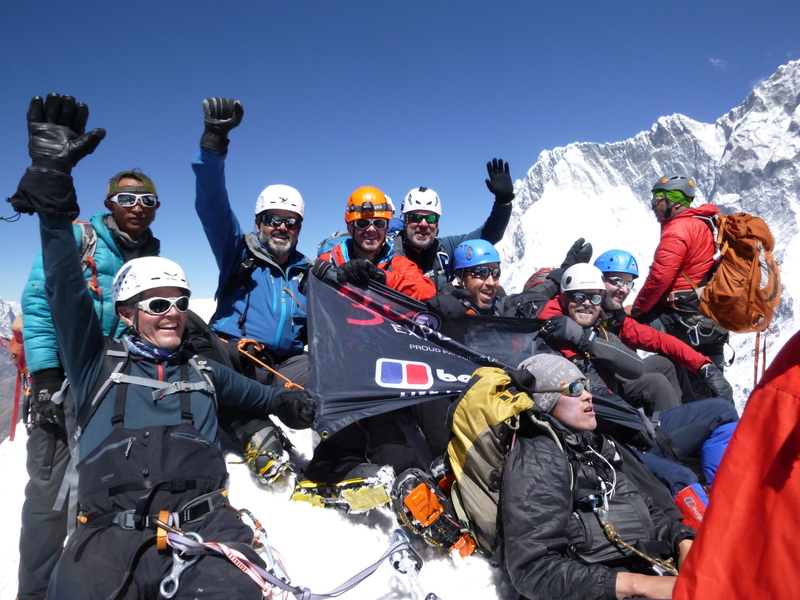 We got some great photos of Everest, Lhotse and Ama Dablam. Had a look around then hiked up a steep hill to the Everest view hotel at 3880m. The highest I have ever been. The sun was roasting and we headed back down after a quick rest. We had only descended about 100m and my blisters became unbearable, I put blister plasters on them the other day but the pressure had built up so bad I just had to limp, putting my weight on my toes. The sanitary pads had just flattened to almost nothing, great. I got back to the room and spent 2 hours taking off the plasters and popping the blisters, disinfecting a needle at 3000m in a room without a running tap is hard work. I had planned to meet Rolfe and do some filming but I felt horrific and couldn’t get out of my bed. Probably the worst I’ve been since I arrived, I had the worlds worst headache and felt like I was going to throw up every time I moved and to top it all off, I had another nose bleed. I’ve worried all day that this could be the end of my trip already, I’m not even a week into it and I’m an absolute mess. I slept til dinner then struggled through a bowl of soup and a slice of pizza, Rolfe says these symptoms are normal and not to worry unless they become worse. Jo gave me paracetamol and the headache eased. Fingers crossed I feel better tomorrow as we leave at 06:30am. I can’t believe I’ve come all the way here and something as small as a blister and a headache is getting to me so much. I can’t even begin to think about summiting Island Peak yet when I can’t even walk 100m without stopping, I’m just trying to take each day as it comes. Definitely missed home today. 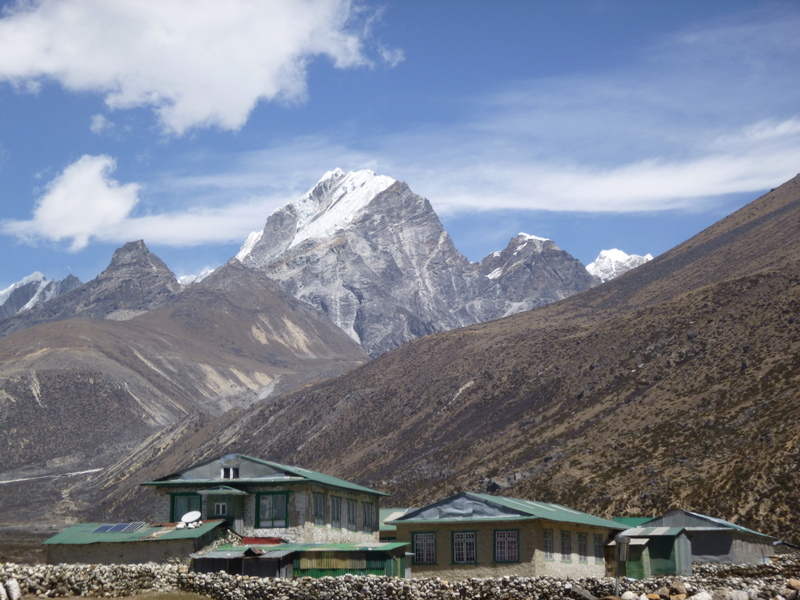 APRIL 10TH –Namche to Deboche – Had a good sleep but still wasn’t 100%, set off early heading for Deboche. The walk was amazing, blisters were much better and I put a lot of my weight onto the walking poles mum and dad got me. No idea why I have only started using them now. The walk took about 4 hours and the narrow track followed the mountain with a steep drop to our right, it finally came round and headed through the mountains and into the cover of the trees, which was a welcome relief from the sun. I felt a lot stronger and really slowed my pace down, Jo tells me that young fit males are usually the ones to suffer with the altitude as they’re used to going so fast whereas middle aged women who take their time cope well and nearly always summit. Got to Deboche and rang home, it was good to hear Kim’s voice and to get away from this constant pressure. I’m missing her. We’re up early again tomorrow, I’ve been going to bed like 8pm every night, I’m constantly shattered! Met some people in the teahouse who were heading to EBC and plan to do the worlds highest comedy gig, good luck to them. We spent the evening sat around the stove whilst the locals burnt yak dung then headed to bed for another early night ahead of a long walk again tomorrow, managed to get some sleep but not before my evening nose bleed, these are starting to p*ss me off. APRIL 11TH – Deboche to Dingboche – Had breakfast, porridge and jam on toast then sorted my kit ready to head out. I wrapped my blisters and set out with Isu for Dingboche (or wherever the next place is called – I’m sure they’re all called Dingboche?!). I’ve started to pile up the sanitary pads at the bottom of my boots and they’re working a treat and just take that extra bit of pressure off the blisters. Every day is so routine now and they are beginning to fly by but I still feel a long way away from summiting Island Peak, one step at a time. We walked for two hours along a track through small villages stopping for boiled water along the way, facilities are very basic now and the toilets are just a hole in the floor! We took it really slow today, or Bistari (my new favourite word), which means slowly, I found myself shouting it every 20 steps as I tried to keep up with the machine that is Isu. I really worry about getting altitude sickness though and I’ve got to focus on taking my time and going slowly. I was reminded of the altitude when we met 2 Israeli lads today at one of the stops, they were young, fit lads heading to Everest Base Camp without a guide. They had done a similar route to me but a couple of days quicker and 2 of their friends had to be airlifted out as they had fallen ill. I saw them again an hour or so down the route and they were flying up the trail. No wonder they got sick! I really struggled with the last two hours, it was just a steep climb and was very difficult. Coming into 4000m there’s only 60% oxygen compared to sea level and we were breaking for water every 10 minutes. Isu shared with me some of his local corn which nearly broke my teeth but I was so hungry I didn’t care. We arrived absolutely exhausted at our lodge for the evening. I was shocked to see that Jo and Rolfe weren’t there yet, turns out they had stopped off to meet Henry Todd, the guy that runs base camp whilst they’re up climbing. I had a walk around the small village and found a shop which sold ginger biscuits, I was in heaven (for 20 minutes) until I’d ate them all. Spent the evening reading and sat around the indoor stove burning dung then I sat outside looking up at the stars, there’s absolutely no light pollution here whatsoever, I’m in my element! One of Jo’s friends came and met us at the tea house, his name is Derek and he is the ‘artist on Everest’. He plans on setting up a tent at basecamp and to invite people along to fill out a postcard detailing why they’re there along with a photo of themselves. Really nice guy, I said I would pop in and have a go when I got there. APRIL 12TH – Dingboche acclimatisation day – Up early again keen to not waste any time here, set off about 07:30 after breakfast up a nearby mountain with Isu. We set off before Jo and Rolfe who planned to catch up and summit with us, I don’t know how Rolfe copes at this altitude, I’m eating thousands of calories a day, drinking 5 litres of water and I’ve only seen him drink coffee since he got here! The climb was really tough but I took my time, it was roasting again. Halfway up we were able to see Island Peak and Lobuche either side of the mountain we were on. They looked tiny compared to the neighbouring mountains. We reached the summit after a few hours of walking, Jo and Rolfe had caught up and we summited about the same time. We sat away from everyone else on a ledge and took a few photos. I’m laughing writing this because it’s the highest mountain I have ever climbed by far at 5150m and I still don’t know the name of it (I don’t even think it has one!). Compared to the nearby mountains, this is a hill. The air was noticeably thinner at the top but the views were insane, you could see for miles! The giant 8000m+ mountains still towered above us. I was absolutely exhausted and we descended quickly. At the bottom, I planned to meet up with Jo and Rolfe for lunch but completely missed it and crashed out on my bed all afternoon. Woke up and had a walk around the small village visiting the tiny shops. Jo and I went to the bakery late afternoon and met with Derek again. It was nice to chat about things that weren’t mountain related, like home and how nice it would be to have a shower or at least a functioning tap to wash your hands properly. The toilets are really terrible up here, they have no chains and instead you have to pour a bucket of water down it, lovely! The room I’m staying in is nice enough (literally just a bed) but there are no plug sockets anywhere and my phone is dead now. If I’m honest, I’m really enjoying the social media break, we have a lot of down time after the days treks so I’m filling my time reading and wandering about exploring. I haven’t had a phone signal for a couple of days now so had no contact with home. We spent the evening sat around the dung burner talking to the locals who live in the tea house. They spoke about the devastation after the earthquake last year and how they had to pull their family and friends from the rubble for 2 whole days without any food or rest. It’s inspiring how composed they are telling these stories, they’ve always got a smile on their face and just get on with things. The Nepalese are lovely people. I left the common room and spent some time sat looking up at the stars, it’s sad that I’ve had to travel half way across the world to appreciate the simple things in life again. I thought about how these people out here have absolutely nothing but the more I thought about it, they have food, water, a roof over their heads and their loved ones around them, what more do they really need? It’s little when compared to people back home but these people are by far, much happier. Tomorrow we head to Chukhung. Isu tells me it will take us about 3 hours or so, I really hope so anyway, my legs are feeling it now, we haven’t had a rest day since we left Lukla but I’m loving every second of it. APRIL 13TH – Dingboche to Chukhung – Woke up a little later at 8am and did some filming for 360 with Rolfe outside the teahouse. I interviewed Rolfe about his experiences on the mountains, he’s done so much and you can tell how much this summit attempt means to him. The weather was glorious but it’s getting a lot colder now. The trek took us just under 3 hours, the route followed alongside the giant that is Ama Dablam and goes directly towards Island Peak with much of it’s face filling the landscape. We arrived, had lunch and bought a wifi card. Managed to message home, it was good to get messages through from everyone. I haven’t seen a shower in about 6 days now but everyone stinks so it’s fine, we’re all in this together! It takes me 15 minutes to clean my feet and I’m out of breath just doing that. I must be drinking 5-7 litres of water every day but no matter how much I drink, I still have a dull headache. I plan on having a quiet night tonight as we will be heading to Island Peak base camp tomorrow. Sat around the fire chatting to everyone staying at the tea house. Everyone seems to be out here for different reasons but all have their own Everest’s to climb. It’s not about summiting, it’s about having fun on the way and I’ve realised tonight that I need to stop taking it so seriously. Rolfe told me a great story about four clients he took up a mountain. Two of the lads drank every day and enjoyed every minute of their trip whereas the others took it too seriously. When things got tough for them, the lads took it all in their stride and summited whereas the other two struggled and didn’t. The harsh conditions are difficult to deal with and you need to be able to laugh through the tough times. We head for Island Peak base camp tomorrow in the hope that the bad weather clears (it snowed today). We will attempt to summit early Friday morning when it’s coldest and there’s less chance of an avalanche. Early night tonight and up early to do some skills training with Isu, I’m like a kid on Christmas Eve, this should be fun! APRIL 14TH – Chukhung to Island Peak base camp – Spent the morning outside on the boulders near the teahouse with Isu doing skills training. Did some refresher stuff on abseiling and safety on the rope / clipping in and then he shown me how to ascend safely on a fixed line which I’d never done before but it was easy enough, we had a laugh and it was good to get my hands on the technical equipment at last. Seeing Isu with all his climbing gear on got me really nervous, it all became very real! We left the lodge and trekked for 2 hours along the river towards base camp, it was a steady walk and we took our time. We arrived at base camp and were shown to our tents which had already been set up, I spent some time organising my kit ready for the summit attempt, if the weather stays clear we will be up early hours of tomorrow morning to start climbing. The tents are pitched on a small rocky opening in the valley below Island Peak although you can’t see the summit from here. We sat in the mess tent and I met the other group from 360 that is doing a 3 peak challenge (Mera Peak, Island Peak and Lobuche), they have just come from Mera and we will be climbing with them tomorrow. Everyone is really nice and welcoming, we all sat down to a 3 course dinner prepared by the sherpas, soup, tinned sausages, mash, spaghetti and a fruit cocktail for dessert, surprisingly nice! All went to bed about 8pm, we were briefed at dinner that we would be getting up at 1am, having breakfast and leaving at 2am. I’m sat in my tent as I write this under the light from my head torch, the nerves have really kicked in now. I’ve been told we are going separate from the main group of 15 or so and I’ll be climbing with Jo, Rolfe and Isu, they have about 15 Island Peak summits between them so the pressure is on. We plan to set off ahead of the other group but I’m worried I’ll be slow as they’re all already acclimatised to 6000m having climbed Mera. I just need to stay focused and dig deep, I can do this. 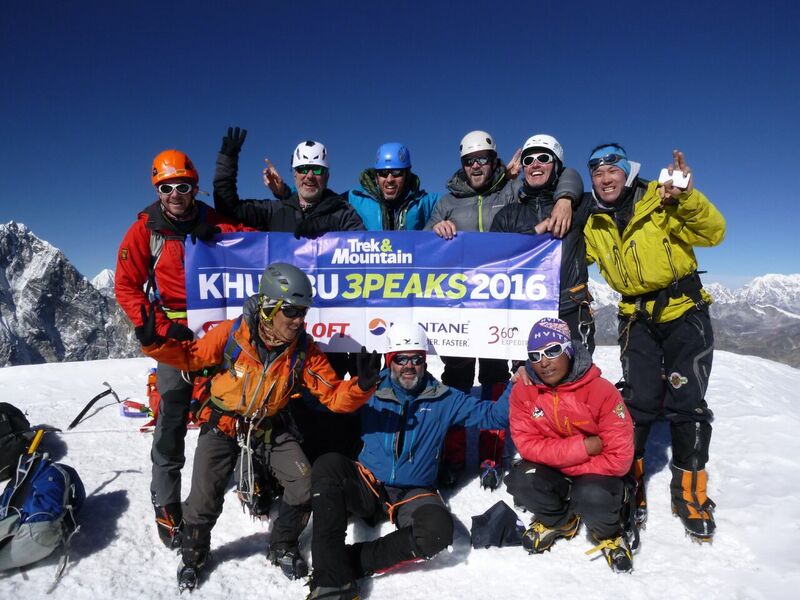 APRIL 15TH – Island Peak – Probably the toughest day of my life! Managed a couple hours of sleep before waking up at 1am, had a bowl of porridge in my tent and put all of my layers and gear on. It was about -10C and pitch black outside, we set off about 2am just in front of the main group. I’ve never seen so many stars in my life, I loved every second of it but couldn’t set aside the nerves, we were climbing in the pitch black, on icy slopes, high above sea level. The route began with a steady incline up a rocky face, zig zagging up until we came to a scramble. With only the head torches to show us the way, I had absolutely no idea of the sheer drops each side of the path, I had full on shaky legs. After a good 2/3 hours, we came to a summit and the sun began to rise. What I thought was a summit was far from it, the mountain just levelled out for a short distance and far up above us we could see what Rolfe referred to as ‘crampon point’. When we arrived at crampon point, we took a short 5 minute rest and put on our plastic boots and crampons, it was all snow and ice from here. We roped together, Isu, then me, then Jo and Rolfe at the back. We set off up the steep snow slope and after a few hundred metres, we clipped onto a fixed line using our jumars and used our ice axes as a walking aid. The slope dropped down below us and at the bottom was what I had been fearing the most, a crevasse. 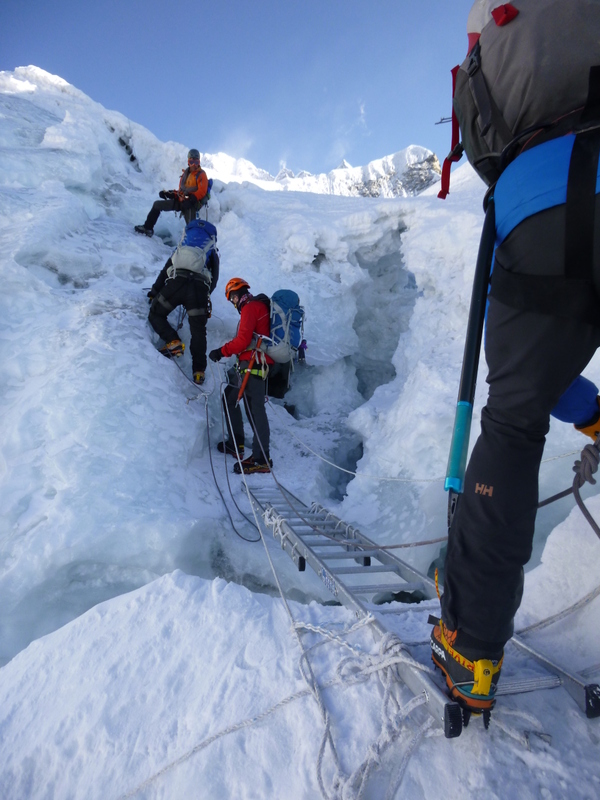 The crevasses can open up at any point and climbers find themselves stepping onto a seemingly stable bit of ground only to fall to their death. The crevasse was huge, about 10ft wide and we couldn’t see the bottom. It was bridged with 3 ladders roped together and the only way across is to walk over it, one step at a time in crampons and heavy snow boots (not easy at all). Isu was the first to cross then me. I was actually really proud of myself, I didn’t panic and without a moments hesitation, walked onto the ladder. You can’t help but look down when placing your feet and I was focusing hard on not getting my crampons jammed on the ladder and falling into a snow grave. I think the best way is to just go for it, the more you think about what you’re actually doing, the crazier it seems. I made it across fine as did the others but no less than 20 metres further up a short steep snow mound, there was another. This crevasse was bigger than the first and was more exposed to the wind, which made things that little bit scarier. Again I just went for it and Rolfe recorded me walking across, I can’t wait to watch that back! After the crevasses, we had a good long walk across open snow leading to the infamous summit ridge. When we got to the usual route up, there was no fixed rope. Isu and Rolfe climbed about for a bit until they found another roped route, bad news for us though as it was on the most difficult route. We began climbing the slope very slowly, I let Jo and Rolfe go ahead of me as I was gasping for breath after only 20m or so. Each step I took was a new altitude record but things only got tougher. The slope got steeper and changed from a slope to giant steps carved out, I got into a routine and dragged myself up to the half way point, one stab of the ice axe, two kicks of my crampons, one giant stretch and a sharp pull up the rope and I was a few feet closer to the summit. The sun was beaming down on us and after well over an hour I didn’t seem to be getting any closer to the top. I honestly considered turning back at one point but thought about how far I had come, I’d dreamt about summiting this mountain for so long and could even see the summit but my body was close to it’s limit. My legs were burning and my lungs were crying out for more oxygen, each step up resulted in me leaning back on the rope needing to rest. Rolfe had made it to the top of the section I was on and was spurring me on, after another 10 minutes of sheer pain, Isu and I made it up. All’s that was left was a 50m or so slightly less steep traverse along a narrow ridge leading to the summit. With my last reserves of energy I clawed away at the rope and made it to the top just before slumping down to my knees, completely spent. There was only Jo, Rolfe, Isu and I on the summit. We shared the summit for 15 minutes, taking photos before the other group met us at the top. The views were just incredible, we could see miles upon miles of mountainous terrain stretched out in front of us and to our right stood the 8000m+ giant wall of Lhotse, covering our view of Everest. There was hardly a cloud in the sky, it was indescribable. Not all of the other group made it to the summit and I’m not surprised, it was difficult and they should be proud they even attempted it. Sitting on the top didn’t seem real and I was worried I wasn’t enjoying it as much as I should have done, I suppose that’s why we take photos, so we can remember those moments. It’s funny that we often appreciate the moments more after the experience and I know that in years to come I’ll look back on that memory of standing on the summit. Not so much getting back down, everything about it was horrendous. My dad made a point before I set off that I’d not achieved anything until I got back safely to tell the tale, how true that is. I was running on completely empty by this point, I’d hardly ate a thing and had a dull headache through dehydration, I was running out of water too. The simplest of tasks started to take double the time to do and clipping into my safety line was a huge struggle. I made it down the first ridge (not before falling on my arse after tripping over my crampons!). When it came to abseiling down the second face, I struggled. I had no strength left in my arms to hold the rope and a steady descent was near impossible. I was concerned that I was beginning to slow down other climbers but others were struggling in the heat too. I let Jo and Rolfe pass, I just wanted to get down safely and took it really slow. After what seemed like an eternity of abseiling, I made it to the bottom of the steep section but we still had 1000m to go before we were back at base camp. Island Peak is around 6150m and base camp was at 5000m. We stopped for a short while and I caught my breath and took on some water, Jo made me eat a mars bar but I didn’t feel like eating anything, I felt terrible. We roped together again and set off back to crampon point. It’s easy to understand when you hear these stories of people falling to their deaths on the way down from the summit. The mental and physical pressure you put yourself through has a remarkable effect on your decision making, we had been climbing for 7 hours before we summited and I was ready for some rest. We made it back to the ladders and crossed easily, I had no energy left to worry or care, I just wanted to get down. We took off our crampons and waited for the others to join us. Although I was happy we passed the technical sections, we still had another 2-3 hours of unstable descent ahead of us. I set off with Isu behind Jo and Rolfe and not long into the walk the other group passed me. They looked tired but were more used to this altitude than I was. I couldn’t walk more than 50 steps before I needed to sit and rest. Isu gave me some of his water and I took painkillers to help with the headache. It sounds weird but it didn’t seem real coming down, it was like it was all a dream and I wasn’t really there. After stopping and starting for hours, we finally arrived back into base camp at 4pm the next day. We had been climbing pretty much none stop for 14 hours and I had nothing left to give. The cook had prepared some noodle soup, which I wolfed down before collapsing into my tent, absolutely beaten, but chuffed to bits. I woke a few hours later with a headache and sat in the mess tent with the other group eating dinner and talking about how hard the day had been. I was glad to hear that this was the toughest peak they had done so far, it wasn’t just me that had struggled. I passed out shortly after dinner and slept through til the next morning. APRIL 16TH – Island Peak to Dingboche – Woke up with a banging headache and aching all over. Oh and I’ve got the worlds worst sun burn on my face, I feel and look like a reptile. I had breakfast with the group who were quick to point out my burnt face. I had struggled to find my factor 50 suncream on summit night and didn’t really give it another thought as it was dark when we set off, when the sun came out I presumed I was covered with my sunglasses, helmet and buff, I wasn’t. We set off back down the valley the way we came. Stopped for a drink in a tea house and got chatting to a lady Isu knew, she was a professional photographer ‘Claudia Lopez’, she took a photo of my burnt face (apparently I had the mountain look but I think she just found it funny!). We made it to Dingboche and I bought some credit to contact home. I also paid for a hot shower over the road from the tea house in a small shed, it was amazing (although it did take 20 minutes to turn on) and eager as ever, I found myself stood completely naked in a 2 x 2ft shed staring at a broken shower head, it came on eventually, thankfully! I also treated myself to a sprite, it was liquid happiness after 12 days of nothing but boiled water to drink. Had dinner with the other group then spent the night wandering around the village trying to find a new suncream, no idea where I’ve put mine. APRIL 17TH – Dingboche to Lobuche – I woke up early to a very scabbed face from the sunburn! One of the men in the other group gave me some cream but it is beyond help, I look ridiculous. I’m sort of laughing about it now but looking back I think I had sun stroke after climbing Island Peak, note to self, always wear factor 50! We began trekking to Lobuche heading through the Khumbu valley the views were amazing with huge mountains either side of us. We went at a very quick pace, stopped for lunch then set off again shortly after up a steep hill towards Lobuche. We climbed alongside porters carrying these ridiculously huge wooden boards, it still amazes me how they can carry such heavy loads with ease. At the top of the hill there was a large area filled with shrines of people that have passed away on the nearby mountains. We paid our respects and carried on down the valley, Jo pointed out where the avalanche had come from which wiped out Everest base camp last year. It made me feel quite uneasy being there, especially after passing shrines only an hour before. We reached Lobuche and had some lunch, the guest house is basic but really cool, the common room is full of stickers all over the walls and flags from expeditions over the years. A lot of people stay here before heading to Everest base camp and Kala Patthar. I had dinner with Jo and Rolfe, she shown me the blog she had done of our Island Peak summit, it was nice to be included in it and she really helped me out a lot that day, I owe her a drink! Early night tonight as we plan to head for Lobuche high camp in one day tomorrow to meet the other group then (weather permitting) will hopefully climb early hours the following day. My legs are sore and I keep thinking how easy it would be to just not attempt Lobuche, I can’t let the bad thoughts get to me though. I do feel sh*t but I’ll be kicking myself when I get home if I didn’t even attempt it. I just hope it’s not as difficult as Island Peak! Rolfe gave me one of his books to read (I’ve already read the two I brought with me), headed to bed about 8:30 and fell asleep after reading just 2 pages. APRIL 18TH – Lobuche to high camp – Had a lazy morning sorting kit in the tea house and we only set off in the afternoon as there were no facilities at high camp until the other group got there in the afternoon. Had lunch and set off shortly after, there were quite a few people on the route up to high camp which makes me quite nervous, I’d much rather it just be us on the ropes heading up tomorrow. Started to feel a bit negative heading up, I think Island Peak spooked me out quite a bit but I just need to take my time tomorrow, take extra water and stop for regular breaks. The climb to high camp was surprisingly steep and the weather changed in seconds 200m or so from camp from 30ËšC and sunny to 0ËšC and snowing! The weather is so unpredictable, I’d hate to be stuck in that at 6000m. We got to camp before the main group and I helped Isu set up the tents. I shared a tent with Isu and spent the evening taking on extra calories, resting and preparing my bag for the climb. I hope the weather clears, we are getting up at 2am tomorrow morning, slightly later than Island Peak as the summit is only 700m up from here (I’m now laughing that I just wrote only). Dinner was served to our tents, spam, sausages, rice and some sort of curry (I think). I just ate it all and didn’t give it much thought, I’m not making the same mistake as last time and I’m eating as much as I can. I sat gathering my thoughts for the climb ahead, wondering how difficult the next 24 hours would be, will I make the summit? I fell asleep listening to members of the other group convincing another who had backed out of tomorrows climb to at least attempt it; I’m glad it’s not just me that’s having second thoughts. 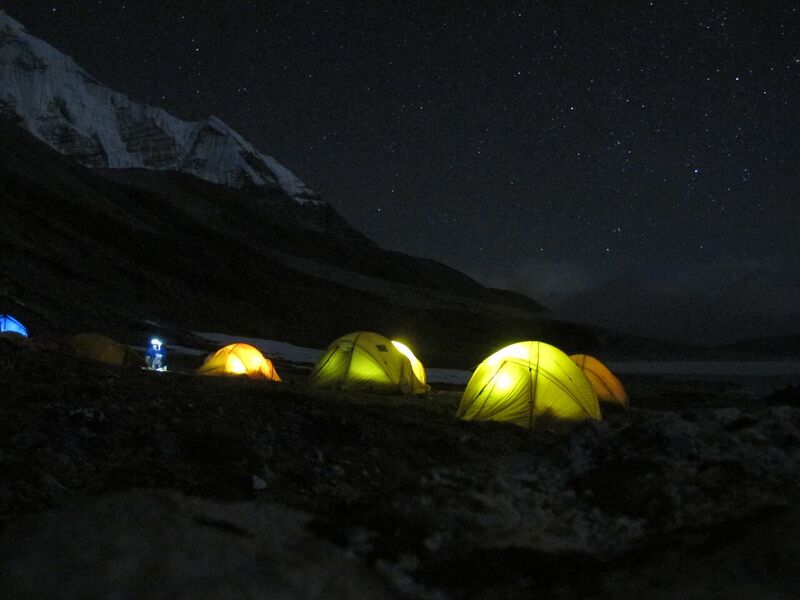 APRIL 19TH – Lobuche high camp to summit – Isu woke me up just before 2am, we are only setting off at 3am now. He just jumped up, got dressed and headed out to make everyone breakfast, (how he has the energy to do all we do and still serve us is beyond me). I got out of my sleeping bag and it was freezing. I’d prepared my kit the night before so there wasn’t really much to do apart from layer up, I covered myself in sun cream and headed outside. The sherpas brought round some porridge at 02:30am and we set off just before 3am. The route was a lot more enjoyable compared to Island Peak. It was more of a scramble than a hard uphill slog and we had to work as a team to get over certain sections in the pitch black. I set off alongside Isu, Jo and Rolfe ahead of the larger group, the rock was slippery with the ice and we had to track back a couple of times to find a safe route up. After about 2 hours or so of scrambling, we arrived at crampon point. Again, the rock was covered in thick snow and ice and we put on our layered plastic boots and crampons, I used this time to eat some food. I covered myself in sun cream again, my face is literally shedding a new one. We set off again roped together as a 4 across the crevasse ridden snow slopes winding around them to avoid any accidents. The views were amazing and we stopped several times on the steep slope as the sun was rising to take photos. As the sun rose, it revealed the tallest of mountains first one by one. After an hour of solid climbing, we reached the headwall, a 300m steep wall of ice and snow leading to a ridge line, which then leads up to the summit. There was a fixed rope on the wall but it hardly made it any easier. Jo and Rolfe set off at their Everest training pace and I got into my own little bubble and counted out my steps. 2 steps, a swing of the ice axe a pull on the jumar and a little rest. The wall wasn’t as steep as Island Peak but it was still really tough. Jo and Rolfe reached the summit just before Isu and I and headed back down before long to avoid a tangle on the ropes. Isu and I took some photos on the summit and admired the view, I sat hunched over looking in awe at Everest right in front of me, it was too much to take it, I haven’t looked back at the photos yet but I know they won’t have done it justice. I’ve never been so blown away by a site in all my life. Up until now we have only seen glimpses of the summit but here we could see the vast majority of Everest with a snow stream coming off the top. It’s hard to comprehend that the summit is still nearly 3 vertical km above Lobuche summit and it had took so much time and effort to get there! We ate some food on the summit and greeted the 5 of the 15 that made it up out the other group before slowly heading back down with much more ease and confidence than Island Peak. We arrived back at high camp around 11:30am. We stayed there til the other 5 got back, congratulated them, said our goodbyes and set off again back down to the Lobuche tea house. My ankle was acting up coming back down from high camp, it wasn’t until I got to the tea house that I noticed it had swollen up, it was good to get my boots off and some trainers on. Had a last supper with Jo and Rolfe as they head off to Everest Base camp tomorrow, all of this has just been training for them, my journey is coming to an end and they have about 6 more weeks left in the mountains as they attempt to summit Everest and Lhotse, I so hope they make it. I had an early night, Isu and I plan to walk to Gorak Shep tomorrow where we will attempt to climb Kala Patthar for sunset, apparently the views of Everest and the surrounding mountains are amazing! APRIL 20TH – Lobuche to Gorak Shep – Ankle is much better today, the climb was easy enough, it didn’t take us too long and we arrived in Gorak Shep a couple of hours after setting off. I managed to call home and speak to everyone. Gorak Shep is tiny, there are only 3 teahouses, tonnes of sandy hills and lots of angry pony’s. The weather wasn’t the best and the clouds came in, we waited it out in the tea house in hopes it would clear for sunset, it wasn’t looking good though. Isu halted our plans to climb Kala Patthar (5643m) til tomorrow morning, again, it all depends on the weather for this one. About 4pm I was sat reading in the common room and Isu came running over really excited, there was a clearing in the cloud and he said if we left there and then, we may get to the summit in time for sunset. The easy option would have been to just say no, I was comfy and it looked horrible outside but I didn’t want to look back and regret anything, so I ran to my room to prepare my kit. We set off and halfway through the climb I could see Isu wasn’t convinced about his idea to climb, he kept pointing at the clouds and shaking his head, but we were committed. Everyone says the views at the top are incredible but it’s pointless if it’s cloudy, which it certainly was. We arrived on the summit just before sunset and took some photos. We sat, huddled together on the summit trying to stay warm. It began to snow quite bad and didn’t seem to be getting any darker, the sun was still high although we couldn’t see it through the clouds. I hinted to Isu we should head back but he refused, I’m glad he did..
After about half an hour of waiting, just as the sun was setting, the clouds moved on and left an unforgettable view of Everest. The 6000m peaks disappeared first then one by one the rest of them vanished leaving Everest and Nuptse glowing with the last of the days light. The peaks lit up and just when I thought it couldn’t get any better, a cloud in between the peaks moved revealing a full moon. It was one of the best views I’ve ever seen. I took tonnes of photos. We headed back down like excited children, it was good to see how happy Isu was too, it must have been a good view because even he got his camera out, it’s cool that he gets to see this place all the time but still appreciates it. APRIL 21ST – Gorak Shep to Everest Base Camp – Woke up at 4am because some lunatic next door likes to sing as he’s putting his boots before he climbs Kala Patthar for sunrise, I crossed my fingers it was cloudy for him and tried to get back to sleep. Eventually got up and set off with Isu for Everest Base Camp, it only took us about 2 hours along quite a flat track. We arrived at Base Camp and had some photos taken at the entrance, it’s basically a pile of rocks covered in prayer flags but you can see right over all the tents of base camp, it was amazing to see, I couldn’t believe I was finally there, this route has seen some of the worlds most famous climbers pass by over the years, it’s a special place to be. Luckily, I was allowed to go inside the actual camp itself as we were filming some kit reviews for Berghaus with Rolfe. Trekkers aren’t usually allowed into the actual camp, the last thing the climbers want is to catch a bug from an outsider and have their summit attempt ruined. There must have been about 500 tents, from small sleeping ones to large kitchen and dining tents. It took us 20 minutes just to find Jo and Rolfe, they gave us a tour of their camp and we did some filming, Rolfe also introduced me to Henry Todd who is running their camp. Their camp is brill, far better than the tea houses, they have charging ports and a shower too and it’s right next to the Khumbu Icefall. The icefall was amazing and I made sure I got my photo stood at the bottom, we must have spent half an hour sat in silence just admiring the view, it was incredible. Finished filming with Rolfe and the sherpas then said our goodbyes, I wished them the best of luck for their summit attempts and left. On our way out we came across Derek (the artist on Everest) and had our photo taken, filled out a postcard too and he stuck them both to the wall of his huge arty tent, it’s going to be an art exhibition in the UK when he gets back, it was good to catch up with him again. Said our goodbyes and left base camp, we got back to Gorak Shep for lunch, called Kim and parents then we set off for Lobuche after lunch. Got to Lobuche really quickly, we flew down. I got chatting to two lads from Dubai who were on their way up to base camp. They were worried about altitude sickness and they only had 2 days left before they needed to be in work, jammy b*st*rds were getting a helicopter to take them back down (I’m only jealous). They appreciated my advice anyway and gave me a galaxy bar in return which was possibly the nicest thing I’ve ever tasted. Isu wanted to stay in Lobuche as it was late but I was keen to get to some thicker oxygen and we set off again on a 3 hour trek to Pheriche. The trek was long and the weather was grim, we walked right down a valley and the wind pounded us as we got nearer to our stop but I was glad we did it when I got here. The tea house is nice but I’m the only english speaking person here, there’s a group of Russians and they’re mental. We sat having dinner in the common room and they were singing Tom Jones classics whilst dancing round a fire, it was very, very strange (but funny). The cabin I’m staying in is the closest thing to a horror film I have ever seen. There is a long corridor with a toilet at the end, there are no lights, spiders everywhere and every door creaks when you open them. APRIL 22ND – Pheriche to Phortse – Despite the creepy surrounding, I had probably the best nights sleep since being here, you can really notice the richer / fuller air. Said goodbye to the Russians after breakfast and headed down the valley with Isu, the route back was amazing. We followed the river down, every corner we went around we waved goodbye (literally) to each of the mountains that have dominated the majority of the landscape the past 8 days, Ama Dablam, Everest, Lhotse and Nuptse. We took a different route back up the side of a mountain along a winding path, which looked like something Tolkien had wrote. The steps were carved into the mountain and there were religious shrines all the way along the route. The path got steeper and steeper which was a shock, I thought we were meant to be heading down! I can’t moan though because I know I’ll miss all of this when I’m back home. The path eventually levelled out and we dropped a few hundred metres into the small village of Phortse, it is so quiet, the only other foreigners here are two American fellas building a climbing school with the locals (all by hand, no power tools whatsoever). Got chatting to the Americans, had dinner and an early night. APRIL 23RD – Phortse to Namche – Set off towards Namche early morning, the weather was absolutely glorious, sun burn is still terrible but it’s getting better, slowly. The route continued to follow the river down, we crossed small unsteady footbridges and took short breaks taking photos all the way. We could see right across the valley and on the opposite side was the route we had taken only a week ago. We were going at a fast pace all morning and Isu finally admitted he was tired! I think his words were “Tom, I am weak!” he said with a smile. Isu has been brill on this trip I can’t thank him enough for all his help and support. His whole life is literally the mountains, I’m sure he only has 3 interests; climbing, spitting (a lot) and kicking large rocks off the side of mountains hoping no one is below! He told me today he began as a porter when he was 12, nearly 30 years ago, what a guy. We finally arrived back in Namche, it’s good to be back. Had a hot shower, it was amazing and paid a local to wash my clothes. Had a lazy day wandering around then sorted and cleaned my kit. Had dinner then headed to the local bar Rolfe had recommended for the football, had a few beers and got chatting to the bar owner who gave me a couple drinks for free because I knew Rolfe, nice guy! Headed back to the tea house about half 10, that’s the latest I’ve been up since I’ve been in Nepal I think! APRIL 24TH – Namche rest day – Had the BEST lie in ever, got up about 9 then wandered around Namche with Isu, bought some gifts and called home. Caught up with Isu later on in the day, he told me he had been at his friends house playing games all day. I was intrigued about the games and instead of explaining them, he dragged me to his friends house! It was a small shack at the back of the town, there were 10 or so Nepalese men playing a board game flicking tokens into holes similar to pool. We had a beer and watched the game chatting to the men (they didn’t really understand me but it was good fun). Went back to the bar from last night with Isu to watch some more football then had an early night, had to re pack my bags so all the technical equipment can be taken down by the porters tomorrow, I must admit, I’m excited to get back to Kathmandu. We plan to walk 7 hours tomorrow, usually people do the trip to Lukla in 2 days but we’re feeling strong and are keen to get back. The weather is meant to be bad in a few days in Lukla too and that could set us back, last thing I want is to miss my flight home. APRIL 25TH – Namche to Lukla – Woke early, had a big breakfast then headed back down towards Lukla, the route back is gorgeous, picturesque views going down the mountainside, we trekked through a wooded area and every now and then there was an opening and we could see the white mountains in the distance, it was quite sad that we were leaving, it’s all gone so quickly. We eventually made it down the hillside and crossed a large river on a swinging bridge, we had to run across a 100m bridge because a herd of yaks were about to cross from the other side, they’re nuts too, no way I was sharing an unsteady swinging bridge with them! We stopped for lunch then headed off in the midday sun, it was roasting! I struggled through the afternoon in the heat, my legs were heavy and I got really agitated towards the end. The route drops down then is quite steep coming back into Lukla, I think Isu likes to joke with me when I ask how long is left, one minute “it’s just under an hour to go” then 40 minutes later, he said “about 1 hour or so to go”, great. I couldn’t moan though because just before we got into Lukla, we passed a porter who had been with us only 5/6 days ago, he had already made it back down and was now heading back up with another group, these people are machines. Probably one of the hottest days since being here but we finally arrived at the tea house in Lukla, we had breakfast here before setting off into the mountains the other week. I was completely exhausted and slept the whole afternoon before dinner. The room is great, shower is roasting (too hot though, you just can’t win!). It’s unreal how different the facilities are back down here, it’s hard to get supplies up the mountain as everything has to be carried by the porters. A group has just arrived from Adventure Consultants heading to Everest Base Camp, they all seemed nervous asking their guide about altitude sickness, facilities, phone signal etc, it’s funny because that was me only 3 weeks ago, I’ve come a long way. Headed back to my room after dinner, we’re up at 5am for our flight out, fingers crossed the weather stays nice. APRIL 26TH – Lukla to Kathmandu – Headed to the airport early morning, it was only round the corner. Spoke to a guy who worked for the Discovery channel who was filming the rescue pilots near the airport, really nice guy and I’m so jealous of his job! That’s my dream. We made it to the airport about 6am, it’s the most unorganised airport ever, people don’t know how to queue here, it’s every man for themselves. We checked in and waited for the planes to arrive, I watched some of them come in and it didn’t help with the pre flight nerves. The runway is literally about the length of a football pitch which goes straight off the edge of the mountain, if the plane doesn’t take off, you’re going down. Fast. Our plane arrived and I managed to get a front seat just behind the pilots, we took off without any issues, the views were just amazing, it was like something out of Jurassic Park when we flew out. I couldn’t help but laugh though when looking inside the cockpit, there was a sign that said “no acrobatics, not even rolls” as if they need reminding! We landed safely and the guides met us in Kathmandu to take us to our hotel. Isu jumped out half way and we said our goodbyes. I’ve been with him every day for 3 weeks and now he’s gone, what a great guy though, I couldn’t thank him enough, he’s been brill. Got to the hotel and met up with the other group I climbed with on Island Peak and Lobuche, they are heading out tomorrow morning. One of the group had fallen ill and there was a spare place on their last meal, I couldn’t refuse! Went to a 5* restaurant, it was perfect but I felt a little out of place in my climbing clothes! We ate like kings, I had to stop in the end before I was sick. Got back about 11pm, said goodbye to the group and went to bed. APRIL 27TH – Last day in Kathmandu – I spent the morning packing my bag for the flight out tomorrow. Did some final souvenir shopping and returned my boots to the rental shop, he laughed when he seen me and congratulated me on making it all the way. I had a sit down meal (alone) and a couple of beers going over everything I’ve been through these past few weeks. I can’t believe it’s finally over, I’ve spent 2 years dreaming of being here, uncertain if I’d ever actually get here and not even sure if I’d summit! I’m thankful that I did summit, thankful I avoided sickness and thankful to everyone for helping me along the way. I’m proud of what I’ve accomplished and all I’ve learnt. If I’ve learnt anything from this experience it’s to not take myself too seriously, stop putting pressure on myself and to appreciate all I have back home. I have no plans to head back out here anytime soon but never say never. All monies paid for the air holiday package shown are ATOL protected. No. 10132. For more info: T&Cs.